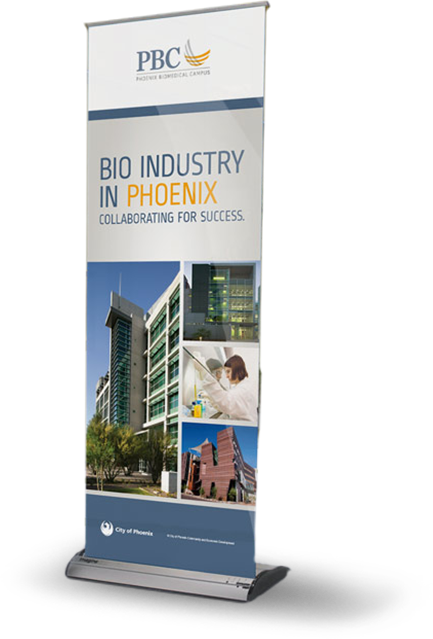 The City of Phoenix Community and Economic Development Department wanted to brand and promote their new state-of-the-art Biomedical Campus, and position Phoenix as an international bio industry hub for innovation and collaboration. We conducted focus groups to gain critical insights with city officials and high-level stakeholders. The research findings provided a strategic road map for all creative assets, led by the development of a new logo. 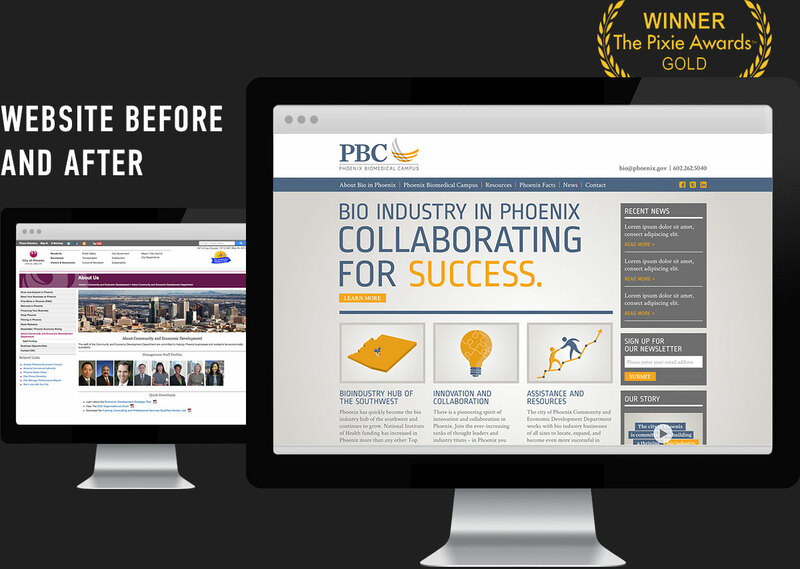 As a critical marketing tool, the website had to communicate the city’s international leadership in the bio industry sector. 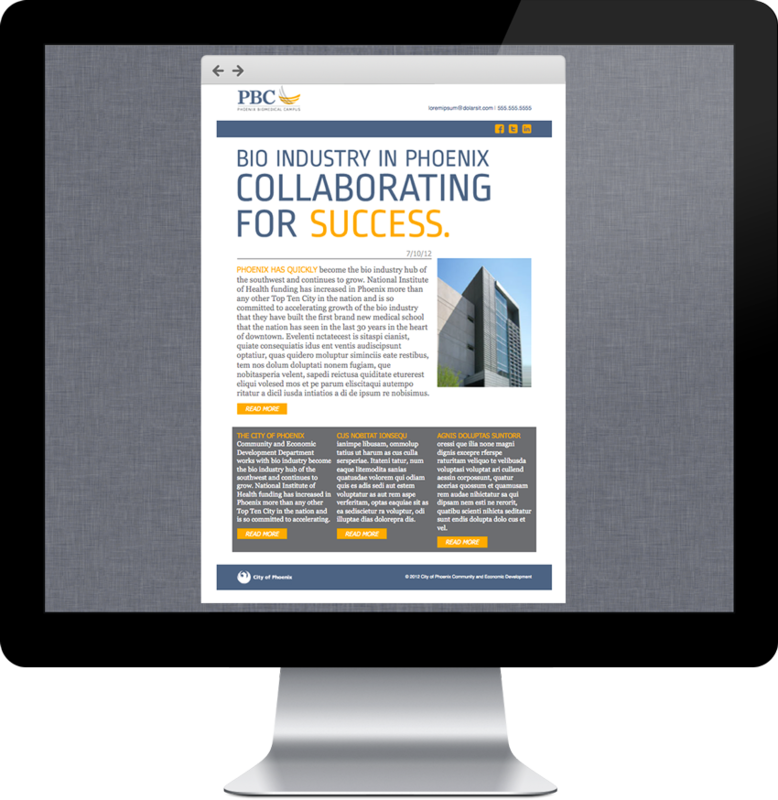 As a result, a complete overhaul was needed to highlight innovation, collaboration and provide specific benefits to bio companies looking to move to Phoenix, Arizona. We established an HTML template in alignment with the new brand. This was used internally for the deployment of e-marketing efforts to the database captured by the new site. We produced a video with statistics and testimonials to showcase the city’s critical role in bringing various expertise together for a successful collaborative effort. In preparation to one of the largest national bio conferences of the year, we loaded the video onto custom web keys. The promotion received great feedback from attendees and high-level stakeholders, driving relevant traffic to the new website. We designed all marketing assets for various events and conferences, including pull-up banners, table tops and event program ads, consistent with the new graphic standards. We developed and managed a PPC campaign targeting national and international markets with outstanding results. The 6-month campaign generated a total of 1,345,790 impressions, including 1,701 hits from India and 26 hits from China. The PPC campaign generated 6,376 visits to the new website with an average duration of 01:23 minutes per visit. Amongst the visits, Google Analytics recorded 1,701 hits from India and 26 hits from China. “Biotech Campus Office Space” was the top performing keyphrase with 2,890 clicks. The campaign generated 1,345,790 impressions and a click-through rate of 0.23%, above the industry standards range of 0.10% and 0.20%.